The radioactive source is defined by its height, radius and material. The height and radius can be changed by simply by clicking the appropriate option in the Source group in the main Angle window and entering the new value. Source height can be equal to zero (“disk sources”). Also, both source height and radius can be equal to zero, in case of “point sources”; real sources, however, always have some small, non-zero dimensions. When a container is selected, the source radius parameter automatically sets to the container’s inner radius. This value can be changed if the source radius is smaller than the container inner radius (e.g. pill sources). If the container type is Marinelli, it is not possible to alter the source radius, and it will always be the same as the container inner radius. The volume of the source is automatically calculated from the parameters and displayed in the “Source” box. This is valuable information when checking whether the source parameters are correctly set. Source material (as well as source height and radius) can be changed using buttons on the “Source” tab on the ribbon. You can choose one of the available materials, or specify a new one. Another, more flexible way, to select the source material is by using the pop-up menu, which you can open by clicking the “Source material” label. The source material pop-up menu contains two additional options. One is “Load saved material...” which opens a dialog to find a material file to load. 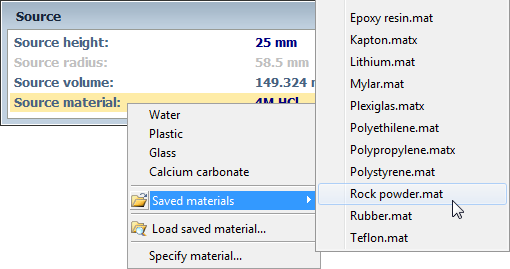 The other one named “Saved materials” opens a sub-menu with the list of all saved materials, from which you can select any previously saved one with just one click. 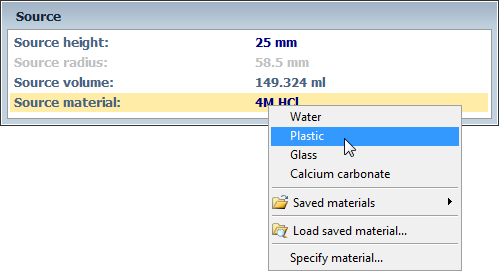 “Saved material” sub-menu is automatically populated with all the saved material files from the default material folder. For more details on custom materials see the Custom materials section.